I loved this activity on identifying and talking about Scripture Superheroes and was happily surprised that our youth leaders were excited to do it as well. Here’s our plan – in Planning With a Purpose format. Refer to this post for more info on how to do Planning With a Purpose and for downloads to help you in the process. I am now serving as the Stake Primary Counselor over Activity Days – that means I am no longer carrying out the activities. But we had already planned these activities with our two youth leaders so I want to share them even though I don’t have photos of the actual activity. I will continue to share ideas as I see them in our Stake. Enjoy! We value accomplishing the Faith in God requirements. We value everyone feeling included. We value respect toward each other. Instead of asking, “What do we want to do?” always ask, “WHAT DO WE WANT TO HAVE HAPPEN? Refer to your list of values to help you answer this question – your values and goals should go hand-in-hand. From the Faith in God Book (Learning and Living the Gospel): Tell a story from the Book of Mormon that teaches about faith in Jesus Christ. Share your testimony of the Savior. NOTE: We are sending out an invitation for this activity because there is something for the girls to prepare before they come. The youth leaders also committed to preparing 2 extra scripture superheroes each (4 total) for girls to choose from if they forget to bring their superhero information. 1. Youth leaders greet each girl – find out if they have their Scripture Superhero ready. If not, offer to let them choose one from the extras that our youth leaders prepared beforehand. This will allow everyone to participate even if they forget to come with a Scripture Superhero. 2. Welcome (opening prayer) – 5 min. 4. Scripture Superhero Share: before everyone shares their superhero, explain that everyone needs to pay attention because when it’s over, each person will share something they “Liked and Learned” about someone’s superhero. 5. Journaling Capes: using the journaling pages found here, girls will write something that they are going to commit to do to be more like one of the heroes we talked about today. 6. Treat: we don’t normally have treats because it’s not necessary and it starts to cost too much money. However, we decided that this time we would have a simple treat of superhero fruit snacks! Cute. Is that actually happening / did that happen? Do we need to change something to get closer to what we want to have happen? Whooo Loves You? I Do! Whoo loves this darling Valentine decor using the Silhouette Advent Calendar? I do! Find my valentine owls here and “Love You This Much” phrase here. We planned a great activity to do before Valentines Day – here it is, in Planning With a Purpose format. Refer to this post for more info on how to do Planning With a Purpose and for downloads to help you in the process. As of last Sunday, I am now serving as the Stake Primary Counselor over Activity Days – that means I am no longer carrying out the activities. But we had already planned these activities with our two youth leaders so I want to share them even though I don’t have photos of the actual activity. I will continue to share ideas as I see them in our Stake. Enjoy! Want to see a Heart Attack activity in action? This video from the 2013 Primary Auxiliary Training will inspire you. Click here. From the Faith in God Book: Read and discuss the parable of the good Samaritan (see Luke 10:30–37). Plan and complete a service project that helps a family member or neighbor. After completing the project, discuss how it helped your faith grow stronger. NOTE: Holly + Sydney will cut extra hearts before the activity because we probably can’t cut them all and decorate the doors in 1 hour. Use extra cardstock and paper from Sister Hall so we don’t have to use the budget. 2. Read and discuss the parable of the good Samaritan (see Luke 10:30–37). Discuss that service increases faith. 3. Heart Preparation: everyone cuts out hearts from donated paper, write messages on some hearts, group into 4-5 piles – 20 min. Sledding for an Activity Days activity. Seems like a simple activity, right? Even our simple activities need to have a plan in order to make them meaningful. We can always make sure there is purpose in everything we do in Activity Days – not just the big events. The Planning With a Purpose model outlines steps to plan and carry out leadership responsibilities, activities and real life decisions. I learned it while serving in the student government at BYU and have practiced it ever since. Here is a step-by-step tutorial on how to use the Planning With a Purpose model. And I’m using our sledding activity as the idea we are planning. 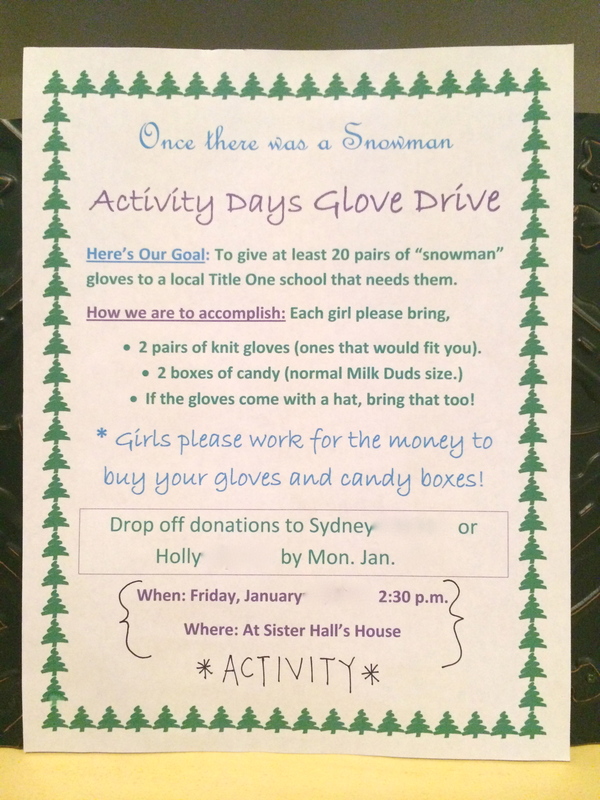 Click here to see how we implemented it using two of our 11-year-old Activity Day girls as the leaders for our Snowman Glove Service Project. This model shows Activity Days but it is ready to be used for Young Women, Young Men, Relief Society – or any kind of planning you are doing. AT BRIGHAM YOUNG UNIVERSITY. GO COUGS! Thank you, BYUSA for teaching me this wonderful method of planning! I am lucky and blessed to have practiced it for the last 20 years. Make a list of things that are important to us (you can use the download below if you choose). What does the handbook say our purpose is? What direction do we have from our bishop or other leaders? What are the needs of the people in our group? Whether you are training youth leaders or planning the activities yourself, use these same values while planning every activity. Plan what you are going to do. Always remember to look at the values to make sure it’s really what you want to have happen. If your plan doesn’t meet your goals in a meaningful way, try something different. NOTE: Listen to the Holy Ghost as you plan. The Holy Ghost can help us feel peace about our decisions and even help us formulate ideas for how to carry out what you want to have happen. 4. Sled for about an hour. Holly + Sydney will monitor the experience and make sure each girl is feeling included, having fun, and a part of the group. They will bring them into the group if necessary. This evaluation happens after the activity – it will help you plan future activities and build on what progress you are making along the way. I encourage you to not skip this step! Give Planning With a Purpose a try! You can do it! Check out this tutorial over at greylustergirl – she used my ampersand shape and WHAT materials to create this 3D ampersand? Go find out! And here is another batch of ampersands available in the Silhouette store. And if you’re a non-Silhouette user, find this ampersand here at Lori’s SVG shop. 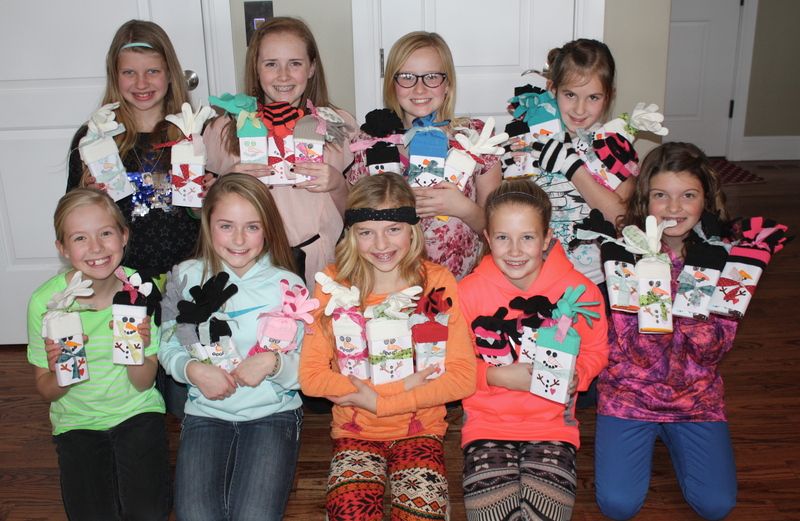 10 Lovely Ladies + 27 Snowman Gloves = 1 Fabulous Service Project! Get ready – this is a long post but it takes you through exactly how I used Planning With a Purpose to teach these girls how to plan and implement a meaningful activity. It will work for any activity – not just this one. These are the words and plans of our two youth leaders, Holly and Sydney, after simple leadership training on the Planning With a Purpose model. I will have the Planning With a Purpose booklet that we used for training available in the near future for download. We want lots of girls to come to the activity. We want the girls to understand that service can be fun. We want them to understand that some people don’t have gloves & be grateful that we do. Invite friends and people who don’t normally come. Tell them it will be fun – that we do activities and not just a lesson the whole time. Create a flyer, announce it in our church classes, send texts to remind everyone. Encourage everyone earn the money themselves for the gloves and candy boxes. Have a lesson to talk about how some people don’t have gloves and why it’s important to serve others. Create at least 20 candy box snowmen with glove hats to donate to a local charity. 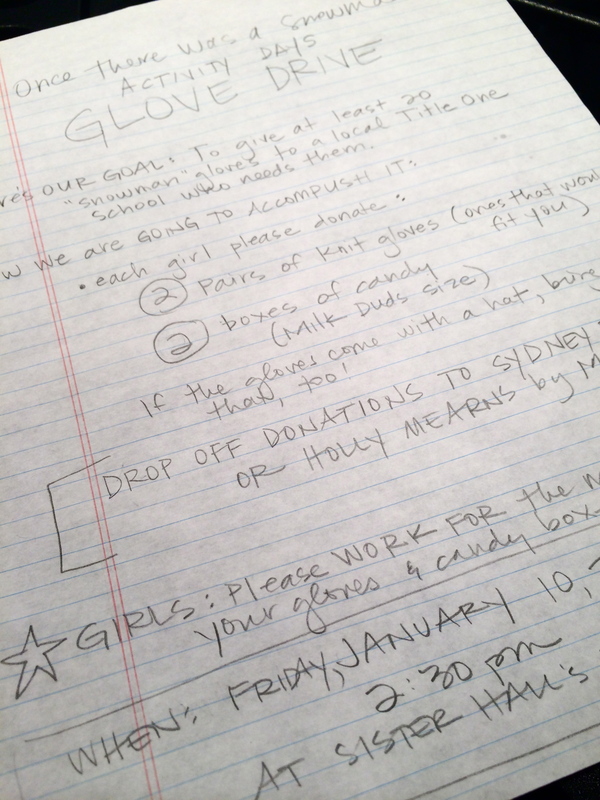 We wanted the girls to be in charge of implementing the flyer. In order to do that, they need guided practice to feel confident and to teach them how to do it. We made a list of all the information that we needed to include on the flyer, organized and ready for the girls to use as a guide for the final flyer.The key to each step in the planning process is “guided practice.” In order to learn how to do something, you have to stand by their side as they practice it. Making a detailed plan of the flyer together was that guided practice. We asked them to do the flyer without parental help (if possible) and bring it back to me to check it one final time then we would send it out. The only thing they ended up needing parental help with was creating the border on the flyer. They did the rest – and were excited to learn how to create a border for future projects. When the girls came to have the flyer checked by me, they told me that they wanted to roll up each flyer and tie it. They also wanted to hand deliver the flyers to each girl so that they could connect with every person in the group. Have I mentioned that these girls are amazing? Yes, they are amazing. They had officially caught the vision of what we wanted to have happen. Texting is by far the best idea for communicating in our Activity Days group. Because the list of girls changes all the time due to girls coming in and going out at their birthday, I keep a running list of the girls and their birthdays on my phone and refer to it when I make a group text. Everyone gets a calendar of events for 3 months but I always text the moms (or dads) the day before the activity as a reminder. It takes about 4 minutes total but our attendance increases when we do a text reminder. For this particular activity, I texted a few days before the Jan. 6 donation deadline, two days after it to tell them they could still drop off the donations, and the day of to remind them and tell them to come even if they didn’t have a chance to donate gloves or candy. Most activities I only do one text the day before. I taught the girls a way to give a great talk or lesson. They (with some help from their moms) used this 3-step plan to create a wonderful lesson. They had practiced it and were prepared. Plus, they did it together. They had experienced success already with this planning process because of guided practice so when I asked them if they wanted me to help them with the actual lesson, they said they could take care of it. As they left the house, with a lesson assignment in hand, I asked, “Are you feeling nervous or confident?” Holly paused for a moment then said, “Confident.” Guided practice is the key to confident, independent behavior. Read Mosiah 2:17. Ask: What does this scripture mean? Share your feelings about the scripture. Holly read the book, “The Mitten Tree” by Candace Christiansen. It is out of print so getting a copy will cost you thousands of dollars but the kindle version is only $6.99 and you can show the pictures from your computer or iPad while you read it. Holly’s mom found it at a local library so we were able to see the real thing while she read this sweet story of service – using mittens! Perfect! After the lesson they turned the time over to me and we worked on the snowman project. Color the snowman wrapper (trim the download across the horizontal lines to fit all sizes of boxes). Plan where the wrapper will be placed and crease the edges. Wrap the paper around the candy box then tape the back very tightly. Place one glove over the top of the snowman. Place the other glove right behind the one on the box and tie gloves together tightly with a fabric strip. Add another fabric strip to create a scarf. 27 snowman gloves later (we surpassed our goal of 20 sets!) – it was a fun, meaningful activity that only took an hour. The girls were so proud of themselves for earning the money to purchase the supplies. Holly and Sydney knocked it out of the park with their responsibility, capability and teachability. It has been a joy to work with them through this process. It’s worth the extra time and effort to go through the guided practice that it takes to actually teach these young people to lead with purpose. Enjoy this activity but love the leadership training that can happen with ANY activity you choose to do! Thank you to Amy for sharing how they are using the “Come Unto Christ” vinyl this year at their New Beginnings event. They are tying it to the “Diamonds in the Rough” idea so she whipped up a beautiful companion to my vinyl shape. Click here for notebook cover printables. Truly lovely. Thank you so much for sharing the photo with us! Don’t you just love the little bling added to the quote? Great connection to the YW theme, Amy.